Will Leaders Allow Youth to Make the World a Better Place? 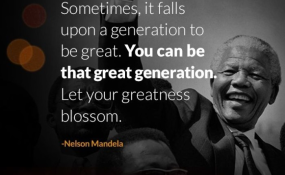 Today the world celebrates the life of one of the world's most iconic figures Nelson Mandela. This year we celebrate Mandela Day under the theme "Action against poverty". Mandela Day presents a great opportunity to revisit commitments made to advancing gender equality. Mandela believed "Freedom cannot be achieved unless women have been emancipated from all forms of oppression. Our endeavours must be about the liberation of the woman, the emancipation of the man and the liberty of the child." Under his administration, Mandela was able to ratify the Convention on the Elimination of All Forms of Discrimination against Women (CEDAW), establish the Commission for Gender Equality (CGE); he appointed more women in his cabinet and declared 9 August women's day in honour of the thousands of women who marched for equality and justice in 1956 amongst other things. In 2013, Colleen Lowe Morna wrote that Mandela's gift to South Africa was not only the first democratic elections... but also the opening of the door to women's empowerment." When juxtaposing the current women's rights situation in the region to Mandela's ideals we are far from achieving freedom and emancipation of women from oppression. Women continue to fight increasingly intersecting struggles of race, gender and class. At a recent event for the Catholic Women's Union in the town of Marrainhill, Nkosazana Dlamini-Zuma, former African Union Commission chairperson, attests to these struggles saying, "The face of poverty is feminine especially in South Africa because women suffer triple oppression. We are oppressed because we are poor, black and female. The triple and persistent challenges of poverty, inequality and unemployment affect women more than they do men." Women's struggles continue to increase due to massive gender inequalities. Economics and politics remain male driven and dominated, Gender Based Violence is on the increase, access to education is not equal, laws and policies often limit women's access to resources amongst so much more. Women continue to live in poverty due of lack of sufficient empowerment. This is disabling them from getting opportunities that will assist them to step outside of the cycle of poverty. An Oxfam research found the world over eight men own the same wealth as the 3.6 billion people who make up the poorest half of humanity. In South Africa, three billionaires (all men) have the same wealth as the bottom 50%. Early this year UN Women in response to the gender wage gap launched the #stoptherobbery campaign on the premise that globally, women only make 77 cents for every dollar earned by men for work of equal value. Furthermore, women in developing are said to work 73 more minutes per day than men. These shocking disparities show that inequalities are still real and pervasive and it will take time to address these challenges and establish inclusive economies that can drive away poverty. SADC countries have prioritised women's economic empowerment through signing instruments such as the SADC Gender Protocol and the SADC Industrialisation strategy, which give women hope to participate effectively and reap benefits that will ensure a better future and status. However, how far have we come in achieving the targets stipulated in the protocols that will help eradicate poverty by 2030? How far have our governments built in gender responsive budgets, policies and laws, education and training, deliberately pushed for equal access and participation and made these trickle down to the local poor and often neglected women? We need concerted efforts to be high on the agenda from not only government but also civil society, business and communities to assist women in realising their full potential politically, economically and socially. This can start to drive away poverty. As we try to make everyday a Mandela Day let us reflect more on the ideals that Mandela lived for. Mandela stood up for the rights of all but especially of women and without socio-economic and political freedom; women will continue to suffer from all forms of oppression. Tarisai Nyamweda is the Media Coordinator at Gender Links. She writes in her personal capacity. This blog is part of the Gender Links News and Blogs service.